We are more socially concerned than generations before, but still we don’t vote. In fact, on May 6th five years ago over half 18-24s in the UK, stayed at home. We didn’t vote, a lot of us didn’t even register to vote, and a new government was elected without more than half of us so much as heading to a polling station. The numbers are even more shocking when you break them down by gender, only 39% of young women voted, making them the group least likely to vote in the entire country. This year things are going to be a little different! A lot has happened in five years, we’ve gone through the worst recession since the 1930s; tuition fees have tripled, EMA’s been cut, young people are 3 times more likely to be unemployed than the rest of the population and another election has come around. Whatever your political persuasion, and trust me, you’ve got one, it’s undeniable that things have changed since 2010 and now you’ve got a chance to let the government, and let the country, know what you think about that. 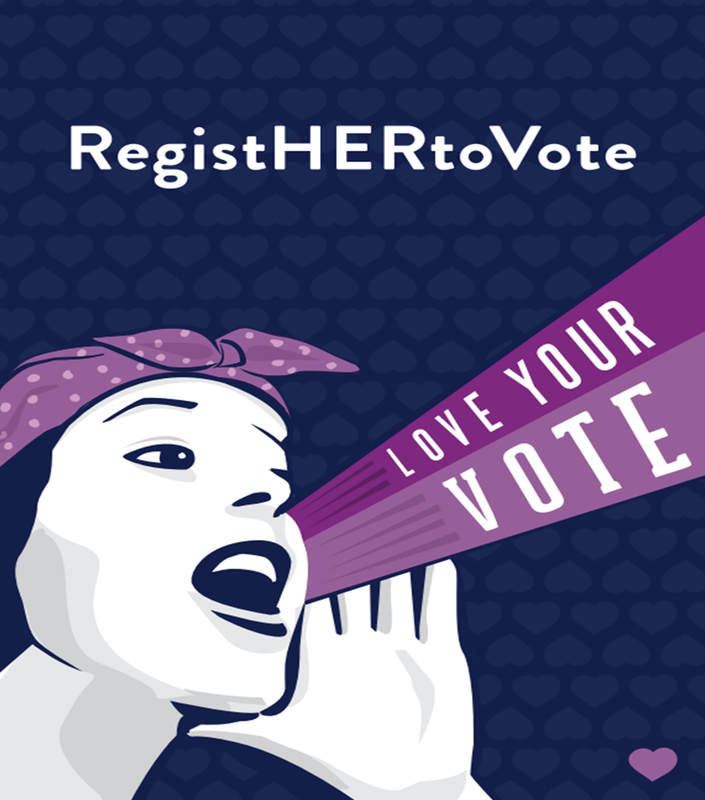 This opportunity doesn’t come around very often and we’re determined to make the most of it, that’s why we’ve set up RegistHERtoVote, a grass-roots action campaign dedicated to getting the women of the UK to stand up and be counted! Of course, in an ideal world everyone would vote but we’re far, far away from that and frankly, looking at the figures, we’ve got a gender problem. In 2010 9.1 MILLION women just didn’t vote, to put that in perspective that’s approximately the population of Scotland, Wales and Northern Ireland combined, not voting. We’ve had enough and decided that 2015 is the year this changes, registering to vote is now so easy it takes less than 5 minutes, you can do it online through our website, and lets be honest, when are we ever not online? You can do it from your phone while waiting for the bus or at work when you fancy a short break – you can do it while boiling the kettle – seriously it’s that easy. Young people are constantly accused of being apathetic about politics and that’s completely inaccurate and unfair. You only have to go online to see the amount of original content being produced every day by young people, on Twitter, Facebook, Tumblr, on blogs and Pinterest. We do care and we are interested, the problem is establishing the connection between social action, community movements, and even just arguing with your friends about Russell Brand, and actually going to a polling station and casting your vote. Everyone has an opinion, you can’t open a laptop without being hit by a barrage of people being angry about something, whether it’s the fact their train is always late, their beer is too expensive or their Surestart centre has been shut down. It’s time we did something with these opinions and the best way to enact direct change is to vote. The unfortunate fact is that in 2010 76% of people over 65 voted, compared to 47% of people aged 18-24 and just 39% of women and the policies proposed by government reflect this. If you’re up for election every 5 years, who are you going to appeal to? The people who stayed in bed on the 7th May? The people who complained on Twitter or made a funny gif on Tumblr? Or the people who, come polling day, without fail, get out and vote in droves? The truth is, if you want to be listened to you need to speak the language and that’s voting. So have a look on our website: Registhertovote.org.uk, sign our pledge to vote, and upload your “I’ve registered!” Selfie - to let your nearest and dearest, and the population of Twitter and Facebook, know that you’re standing up to be counted this May.